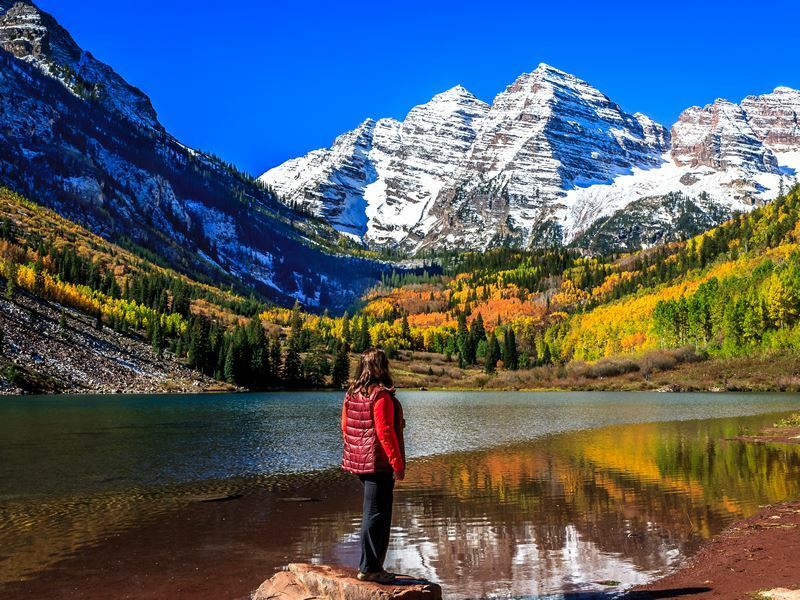 The Rocky Mountain State is home to miles and miles of scenic hiking trails that will bring you to everything from dramatic peaks to glistening alpine lakes, glacier-carved canyons and lush, wildflower-filled meadows. While you could spend days backpacking some of its longer treks, for those on a limited time schedule, there are many short routes that can be accomplished in well under a day that offer the chance to experience some of the region’s most stunning highlights. There are a wealth of outstanding hikes that are within easy reach of the Mile High City if you’re especially short on time. Lair o’ the Bear Trail in Lair o’ the Bear Park is ideal for an easy family-friendly hike, with the trailhead located less than a 30-minute drive southwest of Denver near Morrison. The 1.7-mile shaded trail is mostly flat and you’ll enjoy the sights and sounds of Bear Creek as it follows the water much of the way. Bring a picnic and enjoy a break at one of the many picturesque spots along the banks. Just a 20-minute drive from Denver, and you can be at the legendary Red Rocks Amphitheater, which is best known for hosting epic concerts, but it also offers some great trails as well. The 1.4-mile Trading Post Loop Trail will bring you through 10 of the massive red sandstone formations as well as wide open vistas. Devil’s Backbone in Loveland offers spectacular views of this unique rock formation that looks like a backbone. A number of arches are formed within it that are ideal for taking selfies and postcard-perfect photos. With an elevation of just 200 feet, it’s a perfect hike for families and anyone else looking for an easy stroll. The Ravens Roost Trail is just 2.5-miles round trip, but if you want more, you can continue on North Loop Trail to add another 3.5 miles. Look forward to beautiful views as well as the chance to glimpse an abundance of wildlife, including bobcat, elk, fox, coyote, mule deer, great horned owls, golden eagles, and red-tailed hawks. Horsetooth Mountain Park, just west of Fort Collins, features the 6.1-mile out-and-back Horsetooth Falls and Horsetooth Rock Trail. It leads to a waterfall that thunders down a rocky chute into a small pool 25 feet below – ideal for cooling off on a hot summer day. The water is typically at its peak in June and July, though it should be flowing nicely any time after a heavy rain. The Horsetooth Falls hike and Horsetooth Rock hike are on the same trail for a quarter-mile of the way, with Horsetooth Rock splitting off to the left, while Horsetooth Falls continues straight ahead. Another outstanding hike near Fort Collins can be found in Lory State Park. 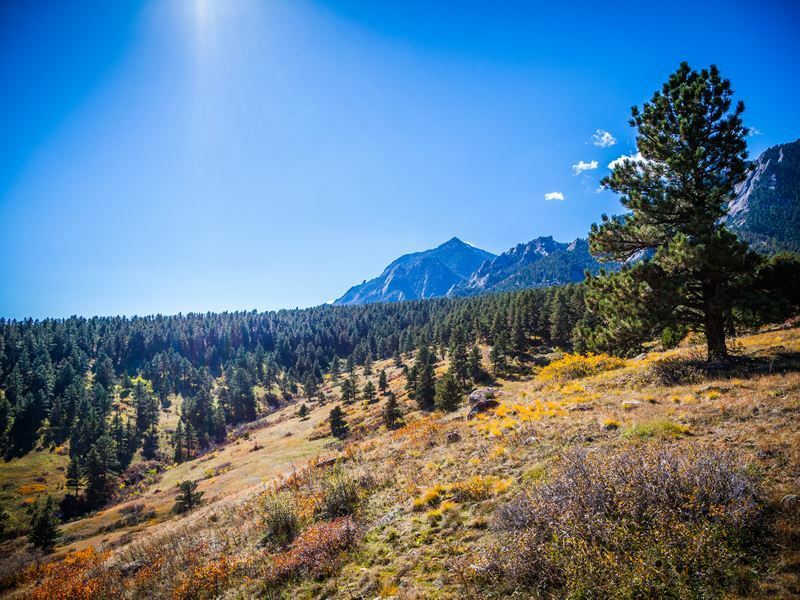 The Arthur’s Rock Trail is 3.4 miles round trip and passes through forest and meadows before ending with a scramble to the top of Arthur’s Rock and jaw-dropping panoramic views of the Front Range. It’s also a great trek for bird watching as well as viewing elk and bobcat. Just southwest of Denver, Roxborough State Park was designated a National Natural Landmark due to its remarkable geological wonders that include hogback ridges, impressive red rock formations and even significant fossil remains. It features trails for hikers of all levels, including the easy 2.2-mile loop Fountain Valley Trail that will bring you to some of the park’s highlights. You can even see evidence of dinosaurs in a number of places throughout the state, including along Dinosaur Ridge Trail in Morrison. When constructing a roadway through the area in 1937, workers discovered hundreds of dinosaur tracks in the Dakota Sandstone that were imprinted as long as 68 million years ago. The best way to view them is to take this 2-mile round trip walk where 15 interpretive signs reveal the various geologic sites along the way. It includes a “bone quarry” where an almost complete Stegosaurus was discovered. 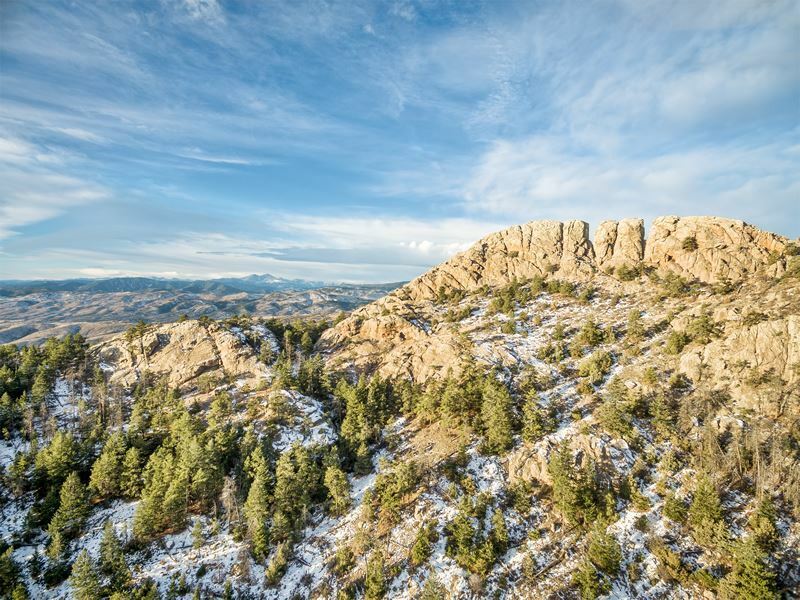 Located in Boulder’s popular Chautauqua Park, the Royal Arch Trail is 3.4-miles round trip and is focused around a soaring 20-foot span of sandstone. Hikers also enjoy a breathtaking bird’s eye view of the city, as well as the plains and foothills beyond. It would be a shame to come all the way to Colorado and not visit Rocky Mountain National Park. One of America’s finest, it’s loaded with dramatic peaks that tower more than 12,000 feet and features some 265,000 acres to explore, along with an abundance of wildlife, including moose, elk, bighorn sheep and more. The Gem Lake Trailhead can be found in Estes Park near the eastern entrance of the park, and while it’s just 3.1 miles round trip, it packs a punch when it comes to incredible views. It travels through a narrow canyon and passes through part of the historic MacGregor Ranch before leading to Gem Lake. Hikers enjoy views of a giant granite rock outcropping that was sculpted by erosion and the elements over the last 1.8 million years, as well as of Estes Park and the awe-inspiring Rockies. 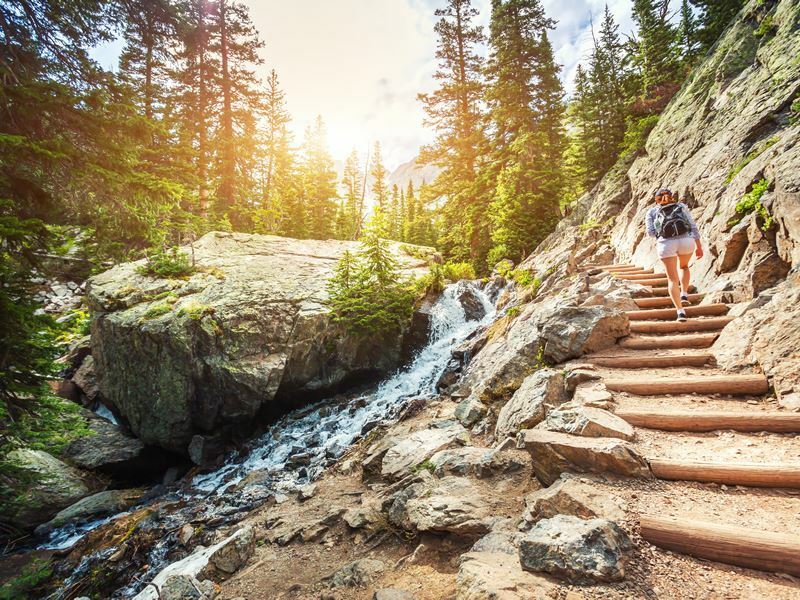 One of the most scenic hikes in Rocky Mountain National Park is the Mills Lake Trail, a 5.3-mile round trip journey that will bring you past the magnificent 30-foot-high Alberta Falls where you can enjoy a picnic on the rocks while being mesmerised by the cascading waters. The lake itself is framed by the nearly 13,500-foot Pagoda Mountain, the over 13,500-foot Chiefs Head Peak and the more than 12,600-foot Thatchtop Mountain. Look forward to waterfalls and wildflowers on the Ouzel Falls hike, a 5.4-mile roundtrip hike where you can spot the rare calypso orchid – look for it beneath the trees and nestled in shady spots. It offers a number of other attractions along the way, including Copeland Falls, Calypso Cascades and the awe-inspiring 40-foot-high Ouzel Falls which sits at an elevation of 9,370 feet. One of the most popular, family-friendly hikes is the .6-mile Bear Lake Loop Trail that winds around Bear Lake in the heart of the park. From here you’ll have a front-row seat for the massive granite domes and glacial valleys of the park, along with multiple lakes. Just be sure to arrive early in the morning beat the crowds as this one is heavily trafficked. Of course, a wealth of hikes can be found throughout the Rockies, and not just within the park’s borders. 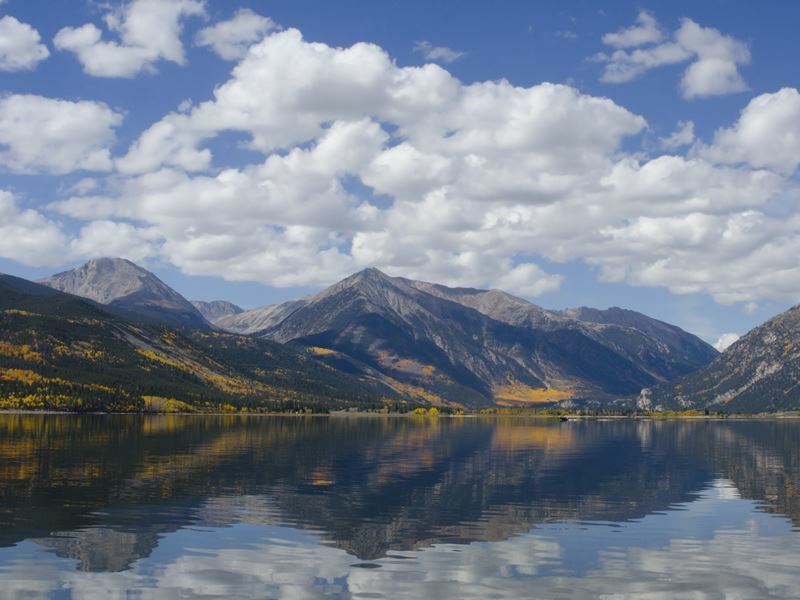 The Colorado Midland Trail to Douglass City is a moderate 5-mile round trip hike located about a half-hour’s drive down a dirt road from the town of Leadville that will bring you to the remains of Douglass City. The trail passes alongside a beautiful stream with a number of small falls, as well as gorgeous meadows filled with colourful wildflowers in the summer. You’ll see the remnants of homes, saloons and many other buildings in this “one street city” that sits at nearly 12,000 feet in elevation. After hiking up, you’ll likely scratch your head wondering how in the world they lugged a piano up to the dance hall back then. The Linkins Lake Trail at Independence Pass between Twin Lakes and Aspen is a 1.7-mile out-and-back trek, short but steep hike that is sure to get your heart pounding while offering big rewards when it comes to views. Nearby is the .4-mile loop trail at the Independence Townsite, home to a population of 1500 in the late 19th-century, when there were more than 40 businesses and three post offices. Many of the structures remain and can still be explored today. If you’re looking for something more challenging, hit the 8.9- round trip St. Vrain Mountain Trail, which sits across the southern border of Rocky Mountain National Park and is accessed from the outside. That results in far fewer crowds, yet brings some of the most jaw-dropping views in the entire state. Ouray is often referred to as the “Switzerland of America,” and you can experience America’s “Alps” by hiking the 4.2-mile round trip Perimeter Trail which surrounds you with breathtaking, jagged peaks. 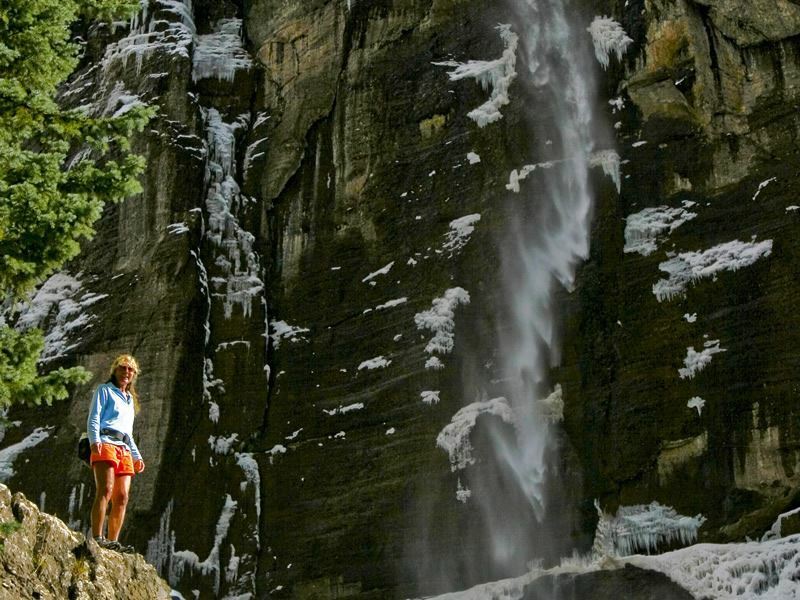 If you’ve got time, the Bridal Veil Falls Trail in Telluride is worth the 8.4-mile round trip journey – the falls are the tallest free falling waterfalls in the state. 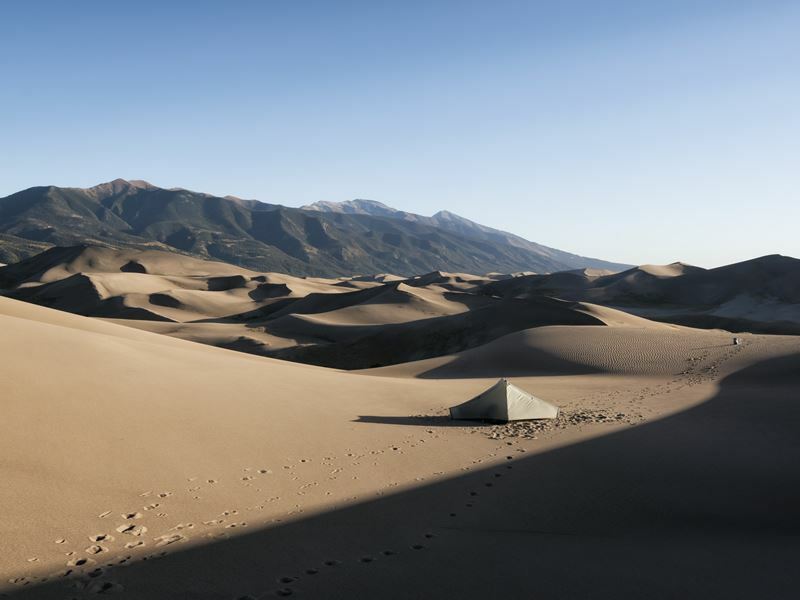 While most of the hikes we’ve listed are all about mountains, Great Sand Dunes National Park offers something more unique – just plan to go from April to about mid-June or late September through October to avoid sizzling hot temperatures and enjoy more pleasant weather. This national park boasts the tallest dunes in the nation, soaring up to 700 feet. For obvious reasons, there are no trails in the sand, so you can simply wander the 30-square-mile area of dunes for as long as you’d like. Mesa County boasts the McInnis Canyons, an area few tourists or even Coloradoans know about. Take the 7-mile round trip Rattlesnake Arches Trail to view this desert paradise that’s home to the second highest concentration of natural sandstone arches on the planet. Dinosaur National Monument sits along border of Utah that features wide open spaces highlighted by multi-coloured rock formations, as well as Carnegie Quarry, a world-renowned site with nearly 1,500 visible dinosaur fossils and interactive exhibits. If you want to hike through a number of its interesting rock layers that illustrate the geologic diversity of the monument as well as offering sweeping vistas of Split Mountain, take the 3.2-mile loop Sounds of Silence Trail which connects with the 1.5-mile Desert Voices Trail. 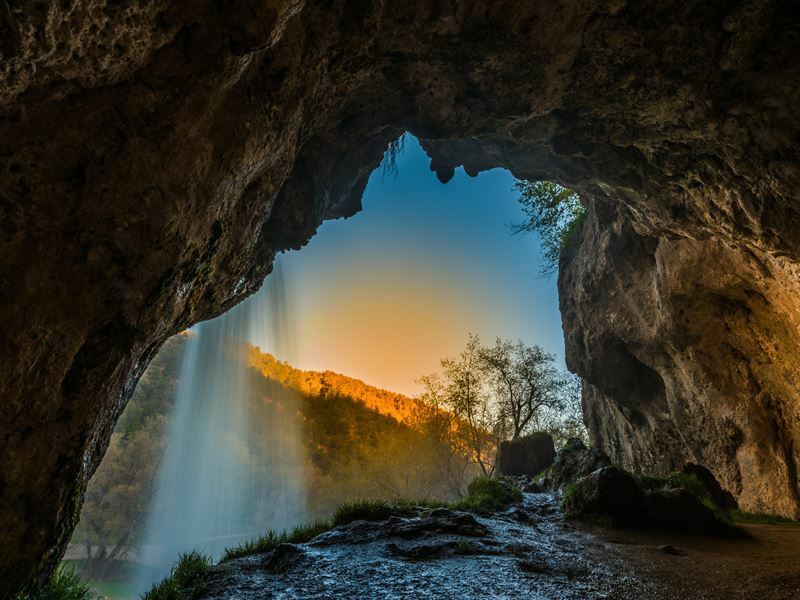 Rifle Falls State Park is one of Colorado’s many stunning state parks, featuring mysterious limestone caves, lush greenery and a magnificent three-tiered waterfall. From the 1.5-mile Coyote Trail, you can see the top and the bottom of the falls and even peer into the caves.